A dozen years separated the town’s incorporation and the building of the Rio Grande Southern Railroad (RGS) to its valley. During the 1880s, transportation became the key to growth, development and, perhaps, survival for Telluride. Dave Wood and Otto Mears were already familiar with one another. Since the early 1880s, Wood’s freight wagons and stagecoaches ran regularly over Mears’ toll roads between Montrose, Telluride and Rico. As the premier freighter in the region, Wood was Mears’ best customer. After the Denver & Rio Grande Railroad (D&RG) installed its line from Montrose to Ouray in 1887, Wood relocated his operations to a prospering stopover between the two towns, a location called “Dallas” (north of present-day Ridgway). Wood was aware that Charles W. Gibbs, the engineer for Mears’ Silverton railroad, had surveyed the wagon road from Dallas to Telluride in 1888 to determine the feasibility of building a railroad. Gibbs’ favorable findings created a stir. Knowing that the advent of rail transportation would spell the end of his freight wagon and passenger business, Wood—and prominent Telluride businessman E.L. Davis, along with other backers—organized the San Juan Southern Railroad Company during the summer of 1889, with the intent to lay tracks in the region. The news of Wood’s proposed railroad venture must have come as a surprise to Mears. From as far back as 1882—when D&RG officials decided not to build a link between Ouray and Durango via Rico—Mears thought that the task was perfectly suited to his own talents. After building most of the wagon roads in the region, why not a narrow gauge railroad? Wood’s plan may have spurred Mears to action. On October 30, 1889—with Colorado Governor Job Cooper, a pair of wealthy bankers and Fred Walsen, a coal mine owner from the southern Colorado town that bears his name—Mears incorporated the Rio Grande Southern Railroad. Following the first of several successful trips to Denver and New York City to woo investors in early 1890, Mears and Walsen turned their attention to acquiring property in Dallas for the RGS’s northern terminal. Wood owned property in and around Dallas, some apparently key to RGS’ plans. But he refused to meet with the RGS men, instead stalling in the hope that his plans for the San Juan Southern would soon materialize. Disinclined to wait for Wood, Mears and Walsen purchased 490 acres of ranch land two-and-one-half miles south of Dallas—a location soon to become Ridgway—in February 1890, where they intended to headquarter their railroad and sell business and residential lots. Stymied by the dual and daunting prospects of raising several million dollars for railroad construction and competing with the RGS, Wood abandoned his plans for the San Juan Southern. On March 4, 1890, the Rio Grande Southern Construction Company was incorporated, with Gibbs appointed chief engineer and Robert M. Ridgway as superintendent of the northern section—from Ridgway to Dolores. Thomas Wigglesworth was made superintendent and engineer of the southern section—from Durango to Dolores. L.L. Nunn of Telluride—soon to become famous for his alternating current electric power plant at Ames—was one of the original stockholders. Nunn acquired the necessary railroad right-of-way through San Miguel County, and he donated the land for the RGS depot with the stipulation that the structure face north toward town, rather than facing the tracks as originally designed. I saw work started on the Durango end, and the force will be increased to 2,500 as fast as the men can be obtained…. Carlisle and Orman, the grading contractors, are under bond to have 500 men at work on the [northern] end by April 5th. They are also under bond to have grading finished into Telluride by August 1st and I shall not be but three days behind them with track. I have not asked [for] any donations of any town or county along the line of road, and do not, but I expect each county to guarantee me a right of way. In this I do not apprehend any trouble as I have not yet met any one so avaricious and destitute of public spirit as to refuse a right of way. If any comes I shall go right along and have the land condemned and will expect the town or county to settle it. We also want depot ground and ground sufficient for our buildings and sidetracks. This end of the road…will be pushed as fast as possible, and will certainly be completed before snow flies. The money to do it is in the bank and the road is an absolute certainty. Dallas, serving as the initial construction hub for the RGS with just over 500 residents and a one-block main street, was soon overrun. One train load after another, sometimes 50 cars to a train, brought in everything needed for building a railroad, including laborers by the hundreds. Initially, the workers were mainly white males, including a good number of Irish and Italian immigrants. Because of an alarming rate of desertion (mostly to the local mines) and a constant battle to separate the men from “extracurricular activities,” teams of Mexicans and Native Americans were hired to perform the backbreaking work. By April, over 2,000 men worked on grading and tie-cutting crews. The Rio Grande Western Railroad and the D&RG were in the process of converting the main line between Denver and Salt Lake City from narrow to standard gauge during the summer of 1890. With the consequent availability of narrow-gauge rolling stock for sale, Mears was able to purchase the majority of his passenger and freight cars and 11 locomotives at considerable discounts. For two months, convoys of these passenger and flat-bed freight cars ran ties, rails, men and equipment from Ridgway to the “front” as it was called. On October 10, 1890, the first scheduled train, operating per RGS Time Table No. 1, made its way from the nearly completed Ridgway Depot, past a throng of the town’s ever-growing population, over the shaky High Bridge trestle (at a mandated six miles per hour), and covered the 26 miles to Placerville in two-and-one-half hours. Placerville, located at the confluence of Leopard Creek and the San Miguel River, had been settled during the late 1870s as a placer mining and cow camp. In 1890, when the RGS crews made their way up valley, the town’s several residents relocated to where the railroad intended to construct its depot, up river approximately half a mile. The new town site was also to be named Placerville. In early October, Wood transferred his freight and stage operations from a rapidly disappearing Dallas (many had moved to Ridgway by this time) to the end of the line at Placerville. And while tracks were being laid up the San Miguel River canyon, Wood ran his wagons and coaches over Valentine Schmeck’s toll road—from the turnoff just above Placerville at Leonard—over Hastings Mesa and along Deep Creek Mesa—on what is now Last Dollar Road—into San Miguel Park and Telluride. On October 23, The Western Slope reported a “fever of excitement” in Telluride, where a rich strike was reportedly made at the Smuggler-Union’s Sheridan Tunnel. “It is estimated that $15,000,000 is in sight, and Superintendent [J.H. Ernest] Waters stated that 1,000 more men will be put to work within a few months.” For Waters (of the Smuggler-Union) and John A. Porter (owner of the San Juan Smelter in Durango), the RGS couldn’t get to Telluride soon enough. The cost of transporting ore concentrates from the Smuggler-Union Company would not only be reduced from $50 per ton to just under $10, but the tonnage of lower-grade ore shipped could be greatly increased. On July 14, 1890, the Federal government had made its purchase of silver bullion—some 4,500,000 ounces per month—mandatory by law, which only intensified Water’s and Porter’s desire for the RGS to make its way to Telluride. They didn’t have long to wait. On November 23, after negotiating a tricky switchback and continuing along the eastern edge of the South Fork River valley, the RGS slowly climbed the south face of Keystone Hill and made its way across the San Miguel River valley floor and into Telluride. Three days later, the first wide-eyed passengers arrived in town, disembarking onto a makeshift platform at what was then serving as the depot, a reconfigured passenger car. 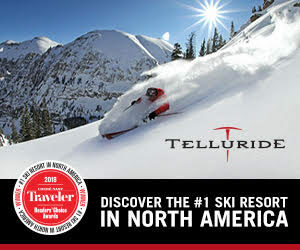 To compensate incoming travelers, Telluride’s stationmaster offered free coach service to any hotel in town. In just months following the arrival of the RGS—with a string of freight cars bringing mining machinery, building materials, household items, business equipment and an assortment of foodstuffs—construction was underway on the Sheridan Building and the First National Bank, the stately brick and stone bookends on Colorado Avenue between Oak and Fir streets. With the world literally arriving at its door, Telluride’s long-hoped-for Golden Age began. The Western Slope reported on September 11, 1890, that “Dallas is slowly but just as surely moving up to Ridgway. Building after building is being torn down and carted off to that octopus-like town which will eventually draw us all into its fold.” On January 1, 1891, the newspaper changed its name to The Ridgway Herald. Little, if anything, remains of the Town of Dallas today. The 2.3-mile spur to Pandora and to the mines and mill of the Smuggler-Union Company was completed during July 1891, paid for by John Porter and J.H. Ernest Waters. Dave Wood continued to run people and freight from Vance Junction to Rico until October 15, 1891, when a wild Silver Spike celebration in Rico was held, ostensibly to commemorate the railroad’s completion from Durango to Ridgway. The two sections of the RGS were not actually linked until December 20, 1891, during a winter blizzard.